Looking for a sport that’ll boost your child’s confidence whilst improving fitness and co-ordination? Squash and Squash 57 is a great choice. While both sports offer a great cardio workout, most kids won’t notice while they’re having fun hitting a ball around the court and enjoying themselves. It’s an all-year-round indoor sport too, so a great alternative to muddy pitches and cold mornings on the sidelines. 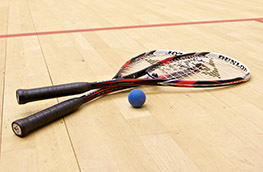 There are hundreds of leisure centres and clubs nationwide offering junior squash sessions and coaching programmes led by qualified England Squash coaches. Use our club finder to locate your nearest club. Junior 101 is a new digital coaching resource packed full of fun activities designed to engage and develop children as young as five. Coaches can simply pick an activity from each section to create your Junior 101 session. The activity cards are available to all England Squash affiliated clubs and coach members. As children develop their skills, a coach can help them take their game to the next level. There are also junior coaching awards developed by Off The Wall Squash which are a fun and engaging way to encourage skill progression amongst younger players. Find a qualified coach near you with our coach finder. Perfect for teachers or level 2 sport coaches (in squash or other sports) this three-hour course showcases our flagship junior programme, Junior 101. The course provides candidates with the content to deliver in schools, clubs and community setting to groups of young people as part of a schools development programme. To express your interest, get in touch with the coaching team: coaching@englandsquash.com. Looking to develop your child's squash leaderships skills? Find out more about the Young Leaders Award here. 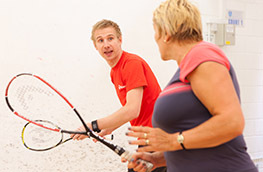 Take your game to the next level with a squash coach.